Names. Titles. Sometimes it seems that coming up with the right ones takes nearly as much time as crafting the book itself. I know I spend a long time trying to get my characters’ names, and my book titles, just right. The writer needs to not only consider if the name suits the personality of the character, as in the example above, but also the genre, the time period of the story, the ethnicity of the character, the age of the character and what names were current when that character was born — it’s a lot to think about! I’m grateful for the internet in this task. No longer do writers have to feel embarrassed when buying baby name books! Name listings for every era are right at our fingertips. I like to figure out when my characters would have been born, then look for names that were popular in that year. This can be narrowed down further by country (or even state!) as well as, of course, boy or girl. You can also easily search for the meanings of names, if you want to have a name for your character that ties in with the story or with their personality. This goes for first names and surnames. Don’t be afraid to change a character’s name later on in the revision process, either! You may find as you go along that the name doesn’t suit the character, or that you have three characters with similar names and it’s too confusing. You may even realize that you have inadvertently used the name of a real person. You can’t get too worried about this, since it’s almost impossible to avoid (unless you name your character Xreaoeurb Wo9qr5 or something equally nonsensical.) But if you discover that your character has the same name, occupation, and locality as a real person, it would be a good idea to rethink. Titles can be even trickier. Although titles can’t be copyrighted, it’s a good idea not to use a title that’s already been used, just in terms of avoiding confusion. You want something pithy, memorable, easy to pronounce and marketable. You want it to entice the reader to open the book and start reading, but you don’t want to give away too much of the story. You want to avoid dullness and blandness, but you don’t want to go too wild and totally confuse potential readers. Titles are another thing that can certainly be changed, and sometimes must be changed for the books own good. Did you know that one of the potential titles for The Great Gatsby was On the Road to West Egg? I’m glad it was changed, although F. Scott Fitzgerald was apparently never satisfied with the title The Great Gatsby. In thinking about a title that will make the reader to want to know what happens, it can be a helpful exercise to reword good titles and see the difference between mundane and enticing. For example, if you saw the title The Mouse Ate a Cookie on a picture book’s spine, you likely wouldn’t even take it off the shelf. But when you read If You Give a Mouse a Cookie… you immediately want to find out what happens. I’m partial to titles that take a familiar phrase and do something unusual with it — titles such as Cynthia Lord’s A Handful of Stars (you have to read the book to find out what the stars are, and how you can hold them in your hand) or Kate Messner’s Capture the Flag and Hide and Seek. I’ve lost track of the number of times I’ve reached for the book Turn Left at the Cow before I realize I’ve read Lisa Bullard’s book before. That’s the power of a good title! 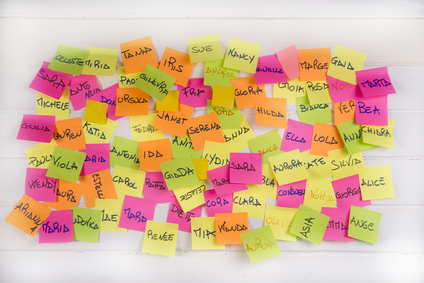 There are more great tips on selecting names at the Writer’s Digest website. Check out The 7 Rules of Picking Names for Fictional Characters and How to Give Your Character the Perfect Name. If you’re looking for more advice on crafting titles, Emma Walton Hamilton has a great, succinct post on her blog: What’s in a Title?. Also check out Karen Woodward’s 4 Things to Keep in Mind When Choosing a Title for Your Book and 17 Steps to a Reader-Grabbing Title by K.M. Weiland. Julie Gribble and KidLit TV Get Ready for Halloween! Thanks, Beth. This is a really helpful post with terrific links. I will be posting the link on my blog. Thanks, Rosi! I’m glad you found it helpful. And big thanks for the share! 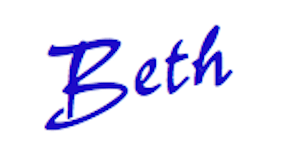 Good post, Beth! I don’t have as hard a time with characters’ names but I am lousy at thinking up titles. Saving this for future reference! You’re welcome, Teresa — and thanks! Titles are difficult, I agree. Catching up on reading your blog today. The naming is very important. And, I did buy a baby name book (after I was done having babies)! I think I’m pretty good at titles. I’ve labored over the naming of characters, though.